Whiting, M (2014) Lost [curator]. 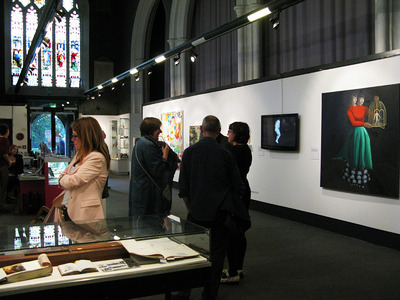 In: Lost, Salisbury Arts Centre, Wiltshire, UK, 21 August - 28 September 2014. Curated by artist Dr Michele Whiting, LOST showcases art of the 20th Century that has been overlooked or forgotten. This new platform gives the artworks a second chance to be seen. LOST reveals what happens to a work of art once it has been made. Work that has been forgotten after an exhibition, something saved from destruction or pieces that were commissioned but never collected, each of the works on display has a story to tell. The 20th century is now just distant enough to begin to be assessed as a complete historical period, arguably one of greatest periods of change in western society; as such it is perhaps a focal point for reflection and evaluation. What shapes the surface of public consciousness though, and what gets written into that period’s history may be considered the tip of the iceberg buoyed up by a mass of overlooked and forgotten or “lost” possibilities, ideas and creations, that might come into relevance (at a future time and place) if only they could resurface. The exhibition LOST sets out to explore this idea and aims to unearth artworks that might have contributed to an alternative 20th Century art history. It will do this by bringing together ‘lost’ or overlooked art works with other kinds of artefacts whose values were not affirmed at the time or which subsequently fell out of view.